This past week I was sick, and it happened to come at a time when everyone seems to be dealing with some sort of illness—whether their own, or that of a loved one. Thankfully, I am feeling better, so now that I am finally able to formulate solid thoughts once again, I wanted to focus this week on how to help others who are facing illness. I am no stranger to hospitals, clinics, expensive pharmaceuticals and a mountain of medical bills. My daughter, who was very ill at birth, takes a laundry list of medications and continues to see specialists across the region. Today, in fact, I will be sitting down to pour through another stack of bills, but instead of bemoaning the fact that our insurance coverage is getting worse each year, or wishing some magic bill paying fairy would arrive and alleviate this pain, I am going to focus on others and be thankful for the fact that the hospital is allowing us to pay off our debt over time. I’m not here to debate healthcare reform. The main purpose of this blog is to remove focus from embattled political debates and instead, look for opportunities to help others within the framework provided in our own towns and communities. So, how do we help? Well, If you know someone who is sick or in the hospital, why not send them a card, or a small gift? Maybe you can call that person, or if they are up to it, stop in for a visit. Let that person, and his or her family, know that you are thinking of them and praying. If no one you know fits this description, maybe you can bring a bouquet of flowers to the local nursing home, telling the person at the reception desk to give it to someone who is most in need of cheering that day. Or donate a new stuffed animal or toy to a Children’s hospital. I can’t tell you the number of stuffed animals my daughter has received during all her stays, and each one is a special reminder of where we’ve been. This is my daughter. A little over one year ago, she decided that she wanted to give back to all the sick children who remained at the hospital after she had gotten better. 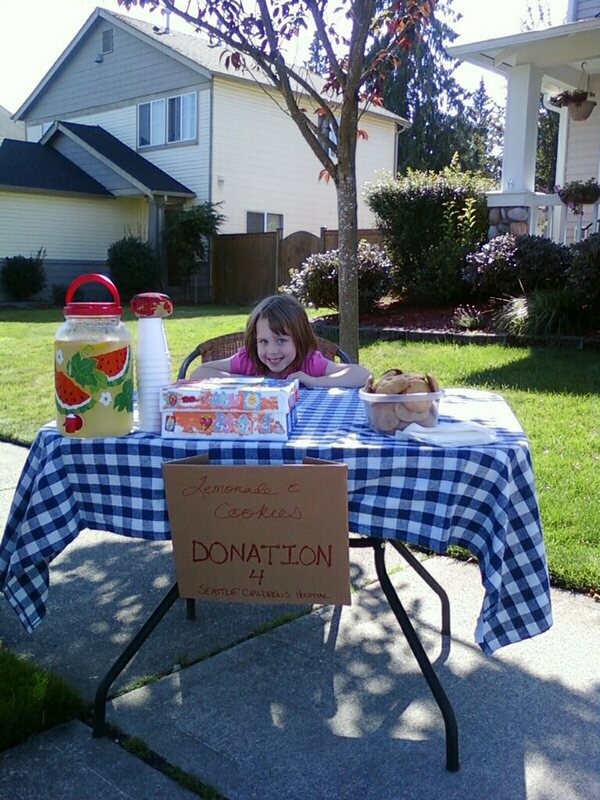 So, this little 6 year old at the time, put together a lemonade stand, asked me to advertise to our friends and neighbors, and over the course of two days, she brought in $575 which she then took to Seattle Children’s Hospital. If a 6 year old can do that, why can’t we all do something similar? So, if you want to take it a step further this week, consider donating to your local hospital. Most have several donation programs/options. 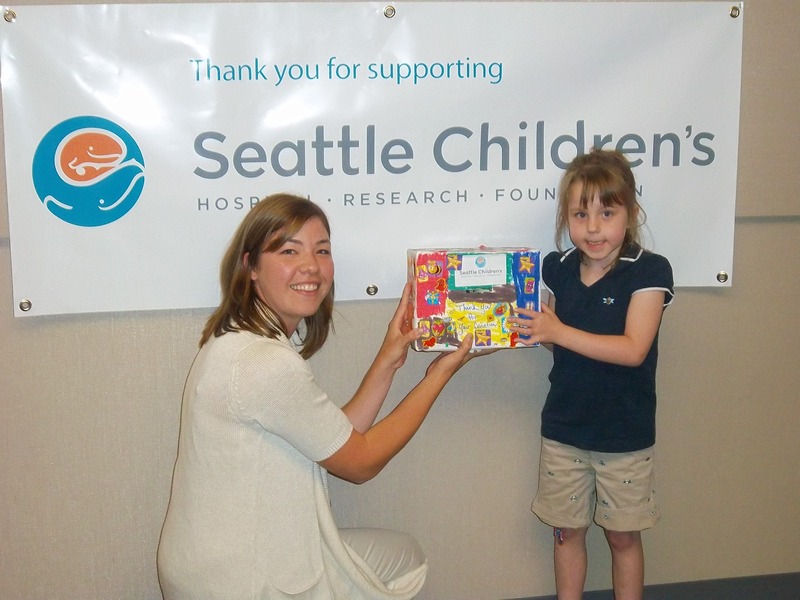 I am inserting a video below for one of my favorites, Seattle Children’s Uncompensated Care Program. This program helps qualifying families by paying off their hospital bills. We were blessed by this program in 2009 when my daughter had her major spinal surgery, and now we hope to bless others through our continued support. I know almost every hospital in America has a similar program. Thank you again to everyone who is joining us on this journey! May you have a blessed, healthy week!